With deep pink sunsets and crystal clear waters ideal for snorkeling and diving, it’s a wonder how the beaches of Cambodia have remained such hidden gems. Until now. Less popular (and therefore populated) than neighboring Thailand, Cambodia’s beaches are ethereal in their beauty and sure to make you feel far, far away. Ideal for sunbathing, collecting shells and crabbing, this beach only began to see development quite recently and retains a very calm and desolate atmosphere. Under the sea, however, is a different story. 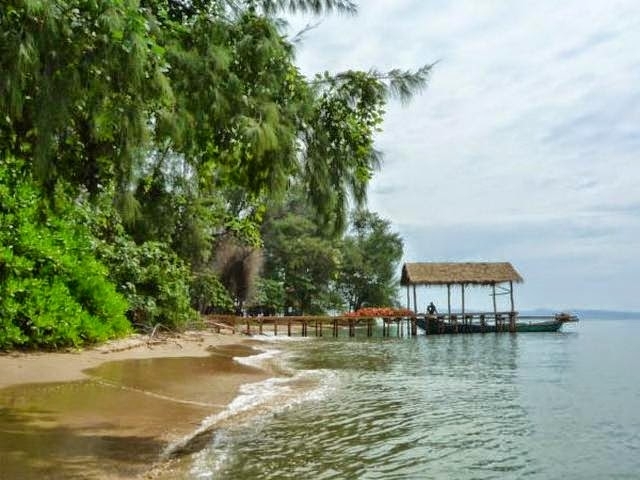 Saturated with marine life and rich coral, Long Set is one of the best locations for snorkeling and diving in Cambodia. And, if you really want to see something special, hang around until nightfall; an evening dip in moonlight unveils a host of bio-luminescent plankton twinkling like an underwater Milky Way. Now that’s something worth waiting for. 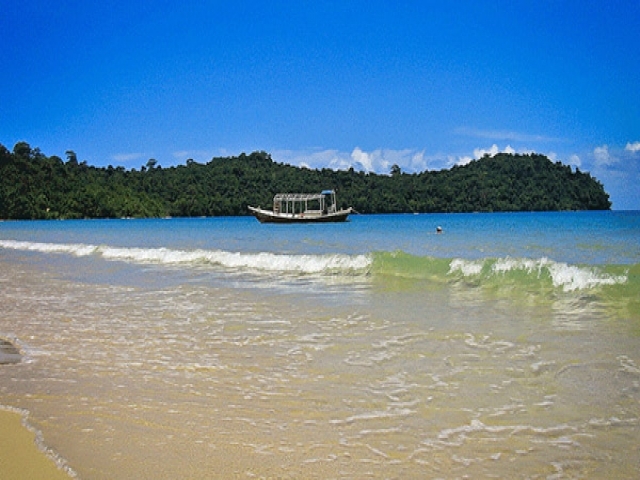 Koh Rong is easily one of the Gulf of Thailand’s most gorgeous islands, with 43 kilometers of beach. 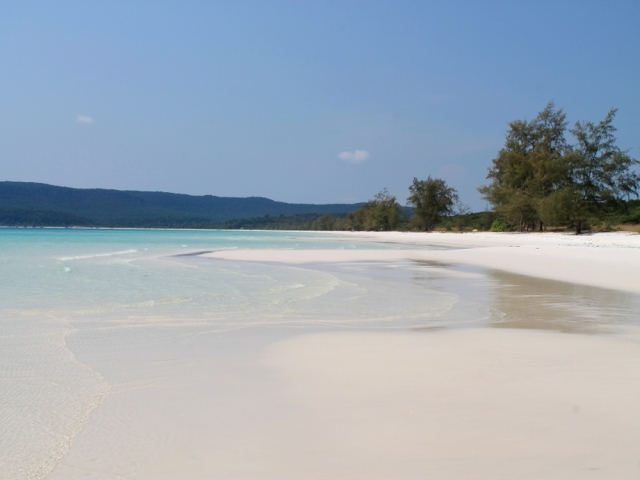 On the southwestern side of Koh Rong the beach stretches for nearly five kilometers -- 5,000 meters of untouched white sand fringed with palm trees and dazzling turquoise waters. At the southernmost end of this beach are rocks where snorkelers can watch schools of colorful rabbitfish, sergeant fish and parrot fish. 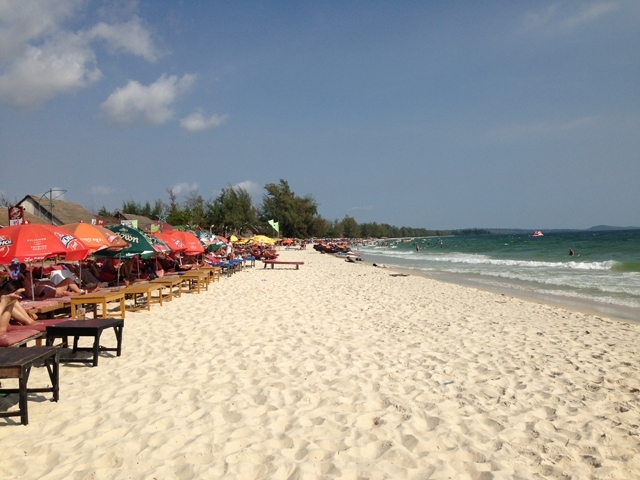 All of the beaches on Koh Rong Saloem, an island two hours off the coast of Sihanoukville, will have you gaping in awe, but Lazy Beach is particularly beautiful. Shaded by pine trees and benefiting from a daily sweep to keep it spotless, the golden sands of Lazy Beach make for excellent daytime sunning. 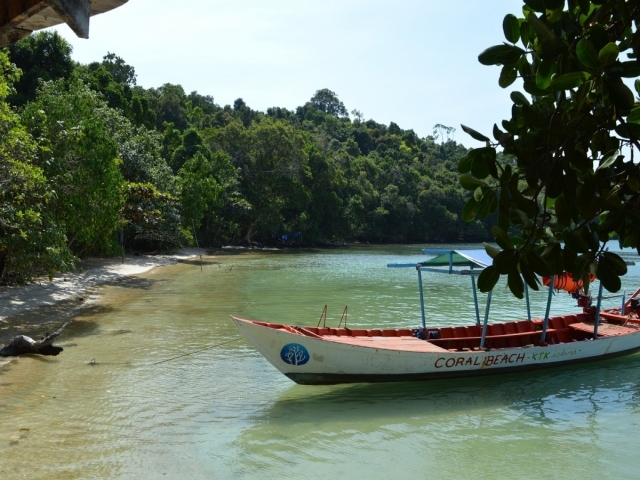 The waters around the beach have many snorkeling options and other parts of Koh Rong Saloem are a favorite of divers and fishing enthusiasts from the mainland. Evenings, you can watch the deep pink sunsets from the beach with a tropical cocktail in hand. Ream National Park is home to some of Cambodia's most exquisite beaches, including those on Koh Thmei, a small island flanked by mangrove forests. 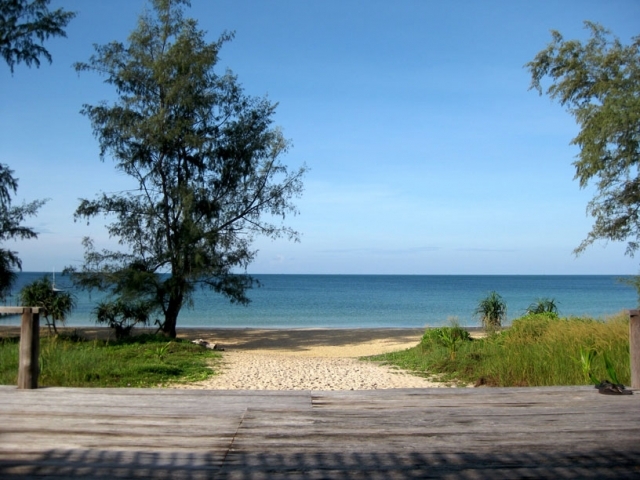 Koh Thmei is uninhabited, except for one set of bungalows and dozens of different species of birds. The beach next to the boat dock is a sea of thousands of glittering shells. The beach to the east of the dock is lovely pine-shaded yellow sand and if you get there early enough, you can catch a gorgeous sunrise. All three beaches on the gorgeous island of Koh Ta Tiev boast vast stretches of golden sands shaded by aromatic pine trees. Vibrant coral reefs provide fabulous snorkeling in shallow turquoise waters, while winding trekking paths through the jungle offer something to do for the more adventurous types (just watch out for the carnivorous pitcher plants. Yikes). A spot of advice, make sure to pack your camera as a number of creatures call this jungle home; including over 150 species of birds (aka wear a hat in case of, well, you know). If you’ve had enough of lazing in the placid shimmering waters and snoozing in the silky golden sands, it’s time to head to Serendipity Beach. 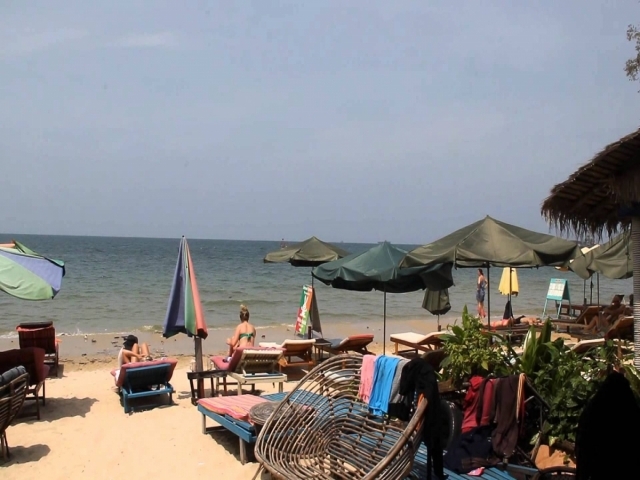 Dotted with quaint restaurants, beach bars and BBQ shacks, backpackers tend to migrate here for late night beach parties and just an overall good time. If you’re here in high season, and don’t like crowds, this may not be the place for you. Otherwise, bring your sun hat and your party hat, and you may just end up having the time of your life. 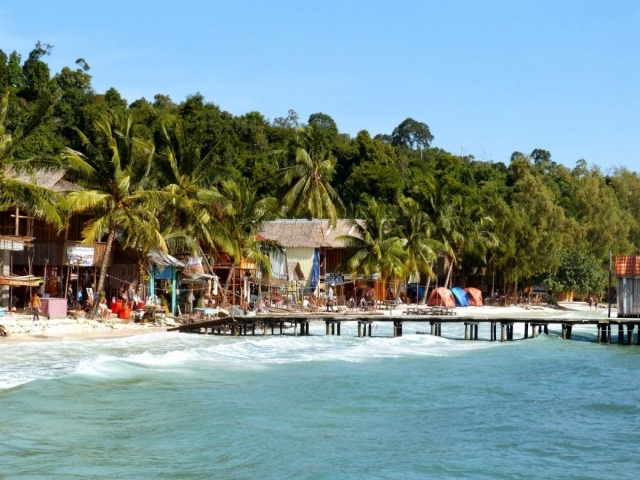 Known most prominently for serving up some of the best seafood in Sihanoukville, Koh Pos Beach is home to a hidden treasure, aptly named, Treasure Island Seafood Restaurant (oddly not located on an island). Small, secluded and extremely well shaded, Koh Pos is ideal for curling up with a book, gorging on lobster and finding that respite from the hot sun while your burn is slowly turning into tan (we’ve all been there). Word to the wise, keep your possessions within reach as the resident monkeys tend to enjoy looking through bags for a new toy or snack. Or both. It’s no wonder this beach’s name connotes celebration, Victory Beach pretty much has it all. Between beach bungalows, seafood restaurants, bars and a local nightclub, it would seem you might not have to stray too far to find everything you need (now that’s a holiday). In addition to the host of food and entertainment right at your fingertips, this beach’s location avows it the most jaw dropping views of the town and port as well as chart topping sunsets. So just make sure your beach bag is packed for both day and night time activities (between the sunsets and the resident night club, who knows what the day will bring). Take a deep breath and relax, because you’ve reached nirvana. This beautiful little beach is far away from any urban metropolis (or just local town), making it completely unspoilt. Velvety sands can be seen for miles cradling tired bodies after long days of exploring the crystal clear waters, while a smattering of seafood shacks and beach bars feed hungry bellies and ensure your hand is never without a cocktail (this is a holiday after all). Part of Sihanoukville’s most glamourous resort, Sokha Beach offers the type of place you would imagine if you were able to travel through your computer and onto your desktop background (which we do daily, but have yet to master). Immaculately pristine with practically effervescing white sands and warm mint coloured waters, we can’t think of a more ideal location for perfecting that bronzed goddess look. One slight hitch is that this beach is 80% private, as property of the Sokha Beach Resort; however, the other 20% is free to frolic in. And if the public end doesn’t quite live up to full utopian status, simply purchase a guest pass and gain full access to the private area (which gives you access to the hotel pool as well). 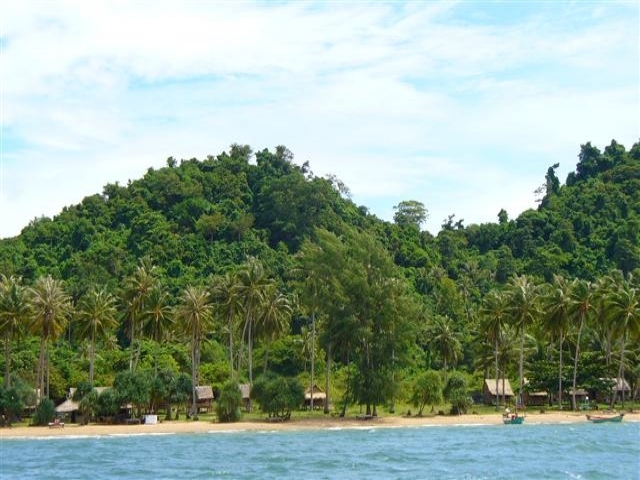 Despite Rabbit Island’s close proximity to the mainland, once you’ve stepped onto the soft sands of the main beach in Koh Tonsay, you’ll feel a million miles away from the world (see ya troubles). Lined with gorgeous palm groves and authentic thatched beach huts that serve up local beers and seafood, this stunning stretch of sand is the exact opposite of a manicured resort beach experience. Paradisaical in a rough and ready kind of way, don’t be surprised if you’re greeted by a family of scampering crabs, or the odd chicken. Or wandering cow.